Only 1 in 10 Americans (10.5%) check all the right boxes for financial health, according to a NerdWallet analysis of consumers surveyed on key measures such as retirement savings, emergency funds and protection against financial setbacks. About 1 in 10 Americans (11%) say they spend more on monthly expenses than their household income allows, and about one-third (32%) say they just make ends meet. Thirty percent of Americans are not saving for retirement, and about one in five (19%) have nothing saved for emergency expenses. 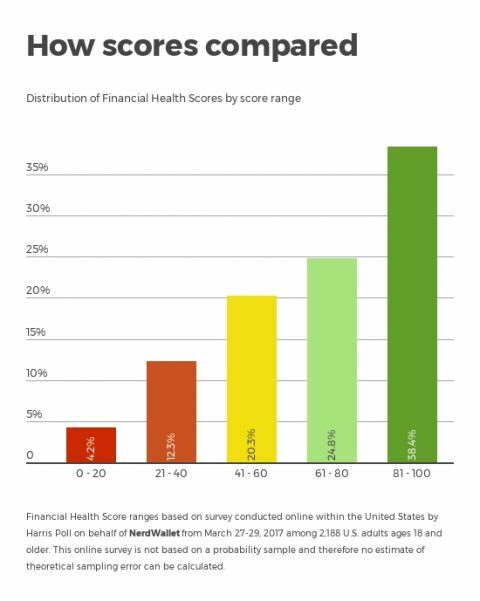 Financial health means more than just having cash in the bank or an excellent credit score, though those are good indicators. Personal finance experts generally agree that financial health is the ability to manage daily finances, save for the future and weather a financial shock. About 12% of Americans scored top marks for all three measures. The survey also asked Americans about indicators of financial stress, such as late bill payments or burdensome debt, and factors that would help them weather a financial shock, such as adequate insurance and a good credit score. Monthly expenses 11% of Americans say expenses exceed household income. 32% say they meet expenses with nothing left over. Emergency funds 19% of Americans have no emergency funds at all. 14% have savings that could cover two weeks of living expenses or less. Retirement savings 38% of those ages 45-54 are not currently saving for retirement. Paying bills on time 11% of Americans say they pay few or none of their bills on time. Credit card use 16% of Americans say they never or almost never pay off monthly balances in full. Debt burden 29% of Americans say their debt affects all or nearly all their decisions. Insurance policies 23% of Americans say they don't think they have enough coverage to protect them against major financial losses. Anna Helhoski is a staff writer at NerdWallet, a personal finance website. Email: anna@nerdwallet.com. Twitter: @AnnaHelhoski. For complete survey methodology, including weighting variables, please contact Chris Pappas. Email: cpappas@nerdwallet.com.